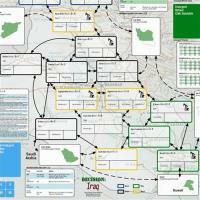 Decision: Iraq, designed by Joseph Miranda, is a game that emphasizes the fight against the insurgency in Iraq, which began in 2003 following the US-led invasion of that country. Historically, the quick US-Coalition victory over Saddam Hussein’s military forces in March of that year quickly degenerated into an insurgency that swept the country. The situation was eventually turned around, but only after a steep learning curve for the United States and its partners. The game shows some of the major factors involved. 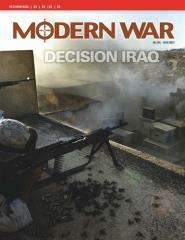 There are two players in the game: The Insurgents (who want to seize control of Iraq. These represent various Iraqi Rebels and Foreign Fighters, the latter including Al Qaeda and Iranian support, among others), and the Counterinsurgents (who want to restore stability to a democratic Iraq, as well as defeat any Al Qaeda elements which may be operating in the country.) These represent Multinational (MNF) forces (US and allies) and Iraqi Government Forces (which also include friendly Iraqi tribal militias). Both players have a set of pieces that represent conventional and unconventional forces. During their respective turns, players move their pieces amongst the spaces on the map, and engage in various kinds of conflict in order to destroy enemy forces. The objective for each player is to establish control over Iraq. One unique feature of the game is that units’, as they engage in combat, effectiveness may increase or decrease as they gain experience in fighting, or become demoralized.